Oh my gosh! I am just catching up to your book publishing posts here! This book is going on my must-buy list. I listen to the Crystal Silence League Hour on the radio, and I have Jon's book "Palmistry for Lovers," which I bought back in the 1990s. He is an excellent writer and thinker. The table of contents alone tells me that I am going to enjoy it, and there are also spells to do ... what a treat. I can hardly wait out the weeks until this book goes up for sale on the web site. I like the old-timey cover, too. It's very enticing. Now I think I am caught up on posts about new books, but there is one more book you announced for the year via the LMC radio show ... by Professor Charles Porterfield, right? I don't see it listed here at the forum yet, but I will check back later. You can order this book from the Lucky Mojo -- just click the blue button with the picture above -- or get it through Amazon, if you prefer. Jon Saint Germain will be a guest on the Candelo's Corner radio show with host Candelo Kimbisa tonight, Monday, May 2, 2016. 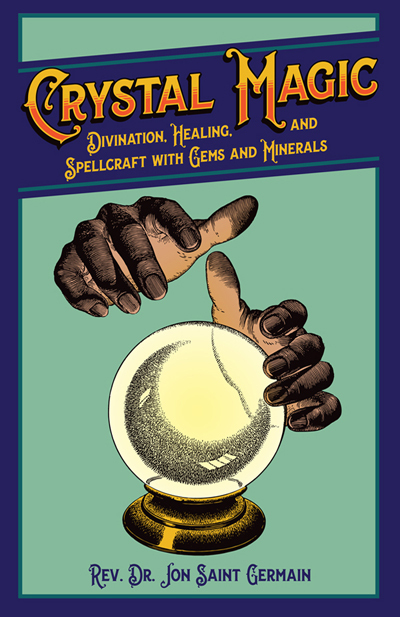 This is going to be an exciting show -- Candelo Kimbisa will be interviewing author Jon Saint Germain about his new book "Crystal Magic," which tells the world all about how to work with gemstones, crystal points and spheres, and even old river rocks for divination, personal healing, and spell-casting. Check it out tonight on Candelo's Corner via Blog Talk Radio! Tune in to the LIVE STREAM and join the LIVE CHAT ROOM at 5:00 PM Pacific time, 8:00 PM Eastern Time ... or catch the show in the BTR Archives after it concludes. The CHAT LOG will be posted here in the Forum as well. You can play the show in the Blog Talk Radio archives and follow along in the chat room, for links and comments. I don't see it mentioned in the table of contents, but does this book discuss crystal grids at all? No, crystal grids are not discussed in this book. They are more of a New Age phenomenon. What you see in the Table of Contents is what you get! I figured, but wasn't sure if it might've been under the chakras or advanced chapters (I know nothing about crystal grids). Thanks for the clarification! I ordered this nice book. Can you tell me about more literature about crystal magic, please? Thanks for ordering "Crystal Magic." Hi! I've just finished reading the book and am investigating which stones are right for me. In the book it lists that some of them when carried will have X influence/work for you. I wanted to know a couple things that I didn't find in the book. 1 - Can I carry the stones in a bag with me as though I would a mojo? 2 - If I were to carry them with me as long as they were cleansed would they work for me with their intended properties? 3 - Or are stones that are NOT specified for carrying ONLY helpful when you go into 'the silence' with them? I think aside from that this book is filled with wonderful information and though I was nervous it wouldn't be a topic that I'd be into, I really think it's opened my mind to new ideas and possibilities to assist and aid the conditions I already work to change with herbs and other curios from LM! I'm just not sure; you may want to try contacting Jon Saint Germain through his website and asking him. I don't know if he'd see your question here. 1 - Yes, carrying stones on a bag is fine. They are not a traditional hoodoo mojo, but they are still a curio bag or charm bag. You can also buy and wear jewelry made with certain magical stones. 2 - Yes, they would, their properties are inherent in them. 3 - Scrying stones and large mineral specimens will not be carried, and that is why you sit and commune with them in silence. I have had good luck charging a small stone next to a big one of the same type, and carrying the small one -- just the way we put lodestone grits on a lodestone as "riders" and then carry them in a mojo. You're a rockstar Miss Cat. I was able to contact Jon Saint Germain who said I could tell them what to do and carry them in a bag. I've been trying to write down exactly how I want to phrase each command to each stone, and hopefully I can charge them by smoking the bag regularly with frankincense incense. Sounds good, and thanks for passing his suggestion back to this thread. Rocks, stones and crystals do indeed remember what you tell them. Stones used for divination should be instructed for their specific purpose. A crystal designated for love, for example, can be smoked in Fire of Love incense, then told, "You are my Love worker. It's your job to make investigations into all matters of love and relationships." This will in no way overpower the crystal's natural attributes, but will add to them. f the crystal's attributes compliment it's divinatory function, all the better. Hope this helps. 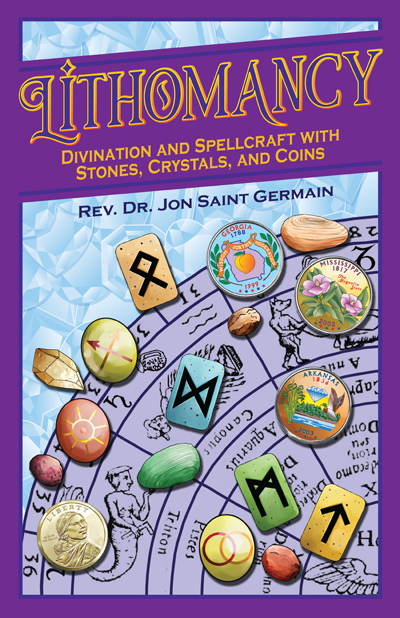 For those of you who have bought and liked Jon Saint Germain's first book on crystals and gems for intuive psychic readings, here's a heads up -- he has a new book out on interpretive readings with rocks, runes, and coins. He provides a dozen systems, using a wide variety of natural, painted, and inscribed rocks. Scrying and reading stone castings are very different systems -- but if you do one, you may wish to do the other, and this is a fantastic resource for both those who wish to obtain quick answers with using their pocket change or three pebbles to the professional readers among us who want to explore a visually striking way to stand out with a highly attractive reading table at a psychic fair.